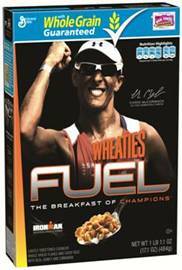 Not only is McCormack the first Ironman World Champion to be featured on a Wheaties box, he is now also the first athlete to be featured on the cover of the Wheaties FUEL box outside of the cereal’s elite co-creators. To tell you the truth, I actually think this is pretty neat. This has the potential to put triathlon into the focus of the mainstream – maybe just a little bit. However, while I was in Australia, I did notice that triathlon had a much bigger foot print. Now, there is no doubt that triathlon is still a second tier sport down under - well behind footie, lawn bowling and net ball. On a side note they seem to call everything footie - soccer, rugby, Australian Rules Football, etc. But at least triathlon is not a fourth or even a fifth tier sport. I mean, there is more card playing on US TV than track and field, much less triathlon. I snapped this picture in a grocery store in Katoomba. We were refueling after a hike to the Ruined Castle. I did not need the box but I did want the picture. I believe we got some fruit. 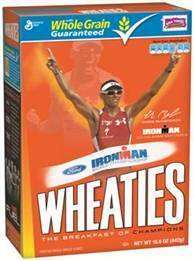 The question - If Chrissie Wellington would have competed and won Kona this year would she have been on the Wheaties box? Oh ya, my personal opinion, Wheaties and Wellington already agreed to terms, contracted was all drafted up, ready to sign if she crossed the finish line, I even bet their was a Wellington Box already in Kona, then she got sick and changed their plans. That's cool that they try to associate that "healthy" food with athletics! 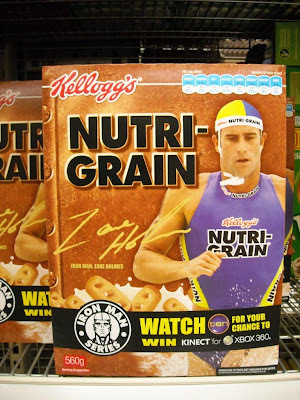 I thought I read somewhere that Wheaties had planned on using a male triathlete for the box before the race...I might be wrong on that, but that is in my head because it ticked me off a little...I think it is awesome that a triathlete gets a Wheaties box though. Even though I am an oatmeal girl.